In May 2010, a group of top officials in charge of the Moscow Kremlin, Vladimir Yakunin, head of Russian Railways and the influential St. Andrew’s Foundation convened to announce sensational news: the historical icons on the Kremlin’s main towers facing the Red Square, long believed to have been destroyed by the Bolsheviks, were discovered behind a layer of plaster and would be restored to their former glory. RussiaProfile.Org, an online publication providing in-depth analysis of business, politics, current affairs and culture in Russia, has published a new Special Report on the 20 Years since the Fall of the Soviet Union. The reports contains fourteen articles by both Russian and foreign contributors, who try to analyze the many changes that have taken place in Russian society since then and attempt to answer two perennial questions: was the collapse of the USSR the “greatest geopolitical catastrophe of the 20th century”, as Vladimir Putin once said, or a blessing for its people? And how far has present-day Russia departed from its Soviet past? Russia Lacks a Unified Policy With Regard to Its Symbols. It was May 2010, when a group of top officials in charge of the Moscow Kremlin, both museum staff and presidential guards, joined Prime Minister Vladimir Putin’s close ally Vladimir Yakunin, head of Russian Railways and the influential St. Andrew’s Foundation, at a press conference, convened to announce some sensational news: the historical icons on the Kremlin’s main towers facing the Red Square, long believed to have been destroyed by the Bolsheviks, were discovered behind a layer of plaster and would be restored to their former glory. It was presented as a highly symbolic case of historical justice on a national scale. The stars, of course, were there. They were there in the coming months, when President Dmitry Medvedev and Patriarch Kirill of the Russian Orthodox Church christened first the icon of Christ the Savior and then of St. Nicholas on the towers that bear their names. Between them, Vladimir Lenin continued to lie in his mausoleum as the chief communist relic and tourist curiosity. 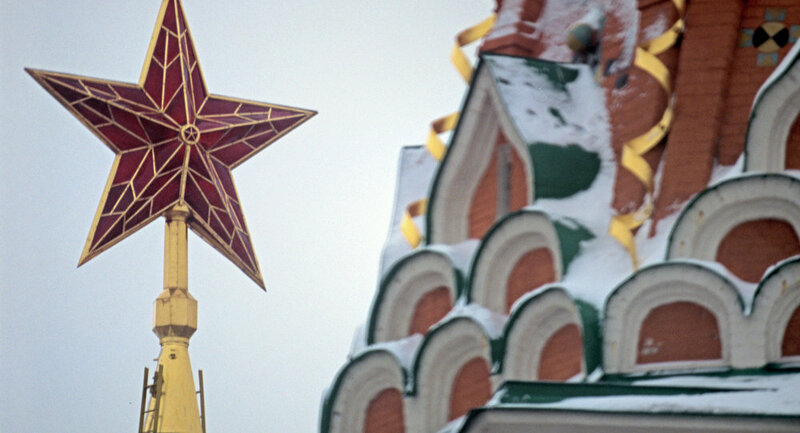 The white, blue and red national flag hoisted over the Kremlin in December of 1991 instead of the Soviet red banner continued flapping over the presidential residence above. It is hard to believe that Yakunin and Gagarina had confused the Kremlin towers with those of the Historical Museum or Voskresenskie Gates flanking the Red Square, where the double-headed eagles were returned atop the towers in the 1990s. Most likely, they were simply not ready to tackle this issue and discuss what had become Vladimir Putin’s policy on symbols: mix up the Imperial Russian and Soviet symbols and ignore the contradiction between the two, thus instilling the idea of “reconciliation” and continuity of one historical Russia. It has not always been like that. As soon as public life reawakened during the perestroika years, national symbols became an important element of political struggle. But only marginal monarchist and nationalist groups carried around the double-headed eagle, while an attempt to re-introduce the white-blue-red flag by one progressive deputy in the Russian Supreme Soviet in 1990 spurred outrage among his fellow deputies. According to sociologist Boris Dubin, at the time half of Russians spoke in favor of the Soviet red flag and only one fifth wanted to bring back the pre-revolutionary flag. From then on, the situation got more complicated. The Soviet Union fell apart, and new Russia had to get a full set of new national symbols. Endless discussions in the Supreme Soviet began, with vigorous opposition to any attempts to introduce any version of the double-headed eagle and a seeming lack of any other possible non-Soviet symbol for Russia. First the State Bank, having to begin printing money, adopted the symbol it borrowed from the 1917 Transitional Government. Its eagle without the crowns was too non-communist for the communists and not sufficiently stately, without the crowns, for the proponents of a strong Russian state, yet it was good enough for the bank. But what was to appear on embassies, government buildings and seals? Having failed to pass the law in the communist-dominated Supreme Soviet, President Boris Yeltsin adopted the modernized version of the old Imperial Eagle—golden on red instead of black on yellow—and passed it by his decree in 1993, after he shut down the Supreme Soviet and before the first State Duma convened. As for the anthem, Mikhail Glinka’s beautiful but quite complicated entry into the 19th century anthem competition, known as the “Patriotic Song,” was picked, and a competition for lyrics was announced, which never yielded viable results. The Soviet national holiday—Revolution Day on November 7—was renamed the Day of Reconciliation and Accord, since people had got used to having a day off. The introduction of November 4—the Day of Russian Unity on the Orthodox Christian holiday of Our Lady of Kazan signifying the ousting of the Poles from Moscow and the establishment of the Romanov dynasty—was part of a new bout of symbolic manipulation, which came during Vladimir Putin’s era of stabilization. Early in his presidency, Putin decided to resolve the conflict as part of his campaign to increase Russian patriotism and “overcome” the instability of the 1990s. He presented the State Duma with a compromise: bring back the Soviet anthem—the music by Alexander Alexandrov written during World War II, but with a new set of lyrics—and legalize the old eagle. This time around, it was the liberals’ time to protest against what many saw as creeping re-Sovietization. But it worked—and stabilized the eclectic and contradictory symbolic space. Even in the commercial sphere, Soviet symbols are still very much alive. When Aeroflot carried out vast rebranding in 2004 it kept its hammer and sickle wing-logo. Thus its flight attendants now wear stylish new uniforms with communist symbols—in a cool orange color—on their sleeves. Georgy Vilinbakhov, the deputy director of the Hermitage Museum in St. Petersburg, the head of the State Heraldry and thus the key author of all new Russian symbols, strongly defends another position. “Are we supposed to be like the Bolsheviks, who destroyed all the symbols of old Russia?” he exclaimed. He argues that it is absolutely normal for countries to have various periods of their history represented in their symbolic space. In England, he said, there are monuments to both Charles I and Oliver Cromwell—who ordered his execution, in French heritage there are elements of the monarchist, republican and Napoleonic periods. “One should take a broad historical approach to symbols and not look at them through a narrow political prism,” he said. According to Vilinbakhov, the combination of stars and icons on the Kremlin towers is nothing but a representation of the country’s “transitional” character. The approach, he said, should be not to take the stars down, but to wait until they wear out and require replacement. At that point, eagles should be installed instead.